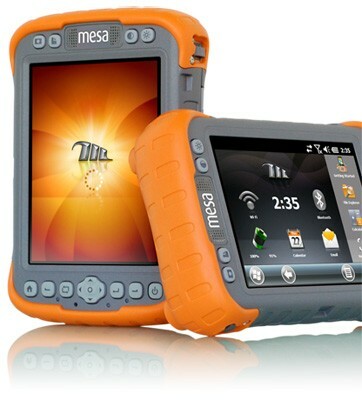 Behold the Rampage 6, aka the Mesa Rugged Notepad! A hardeded hand held computer running the Gingerbread flavor of AOSP. This device is definitly ready for action with its IP67 protection ratings for water and dust. This device will be released into the wild later this year, targeted towards developers rather then consumers. The Rampage 6 will have an 806MHz processor, 256MB of RAM and 4GB of Flash memory. An SD card slot, USB host and client ports, a headphone jack and a 9-pin connector. The standard model will offer Bluetooth and WiFi, while a Geo configuration adds in GPS and a 3.2MP camera.